A mecânica da promoção é a mesma do ano passado: é preciso completar 3 estadias para receber 8.000 pontos Le Club. Mas atenção: é preciso se cadastrar previamente na promoção e fazer as reservas até hoje. 1. 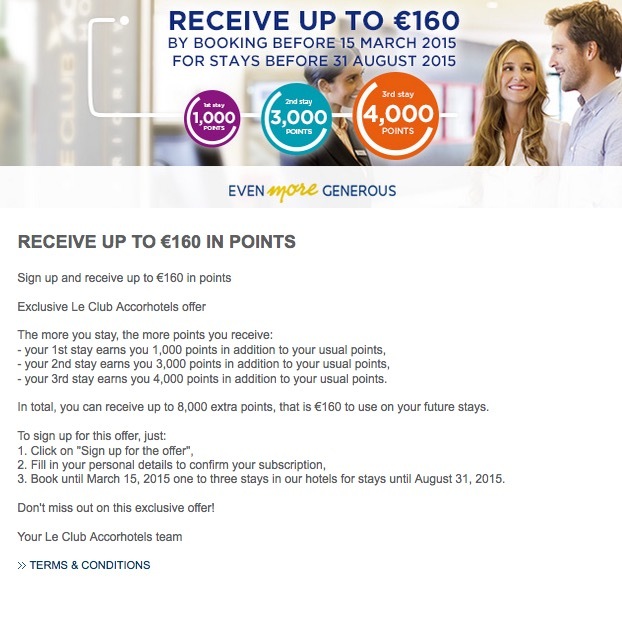 General Conditions of Use of the Le Club Accorhotels programme apply to the “Receive up to €160 in points” offer. 2. To enjoy this offer, the Le Club Accorhotels loyalty programme member must sign up by clicking on the “Sign up for the offer” button above and then follow the instructions. 3. The offer is only valid once for 3 stays per member during the offer duration, for stays between 23/02/2015 and 31/08/2015 in hotels participating in the Le Club Accorhotels programme, booked between 23/02/2015 and 15/03/2015. Stays cannot be consecutive. 4. The points bonus is calculated based on Classic status, not counting points accelerators. 5. The offer enables Le Club Accorhotels loyalty programme and Accor Advantage Plus members, regardless of their status, to receive up to €160 in points for stays in hotels participating in the Le Club Accorhotels programme throughout the world. 6. 2,000 points are equivalent to €40. Points are converted into euros; amounts indicated in local currency are not legally binding and are subject to change. 7. The stay must be booked online (via Accorhotels.com or one of our brand websites participating in the Le Club Accorhotels programme), via our mobile applications or by calling the Accor Bookings Centre. Other booking channels are not eligible for this offer. 8. The loyalty card or member card number must be presented when booking and at hotel reception when checking in. 9. Le Club Accorhotels bonus points will be credited onto the member’s account within 28 days following departure from the hotel. 10. Within this offer, a stay is understood as one (1) booking per Le Club Accorhotels Loyalty member, regardless of the number of rooms booked. A booking made by a member for several rooms will only count as one (1) stay. 11. The offer cannot be combined with any other Le Club Accorhotels promotional offers and does not apply to groups. 12. Offer subject to conditions and availability. Sales conditions of reserved public rates specific to each hotel apply.